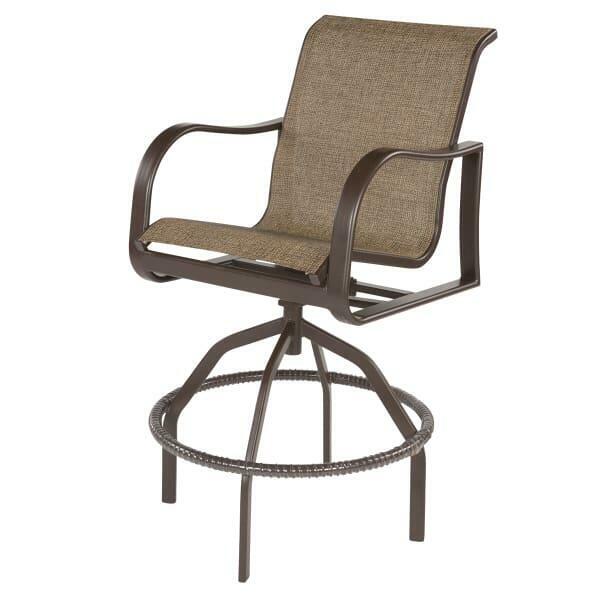 The Corsica Sling Bar Chair by Windward Design Group may be exactly what you are looking for in an outdoor bar stool. It has a pleasing design; simple, yet elegant, and would complement nearly any décor choice. It is constructed of worry-free and low to no maintenance aluminum and has a durable powder-coat finish. The Corsica Sling Bar Chair is rust-proof, chip and peel resistant and requires no special storage. The attractive and comfortable sling is double-stitched for durability, and the Corsica Sling Bar Chair features a vinyl wrapped foot rest. Best of all, this outstanding stool is customizable to your needs with over 9 frame finishes and a wide array of fabrics to choose from. The Corsica Sling Bar Chair is proudly made in the USA.